Although the initial optimism surrounding the so-called New World Order has faded, the importance of moral and ethical values continues to affect political debate throughout the world. In this book, Frances Harbour demonstrates through case studies how people of different moral perspectives can approach the problem of international ethics.She introduces traditional Western perspectives and applies them to cases in U.S. foreign policy history: the bombing of Hiroshima and Nagasaki, the question of Most Favored Nation trade status for China, and an extended case study of the historical application of ethical reasoning to decisions about chemical arms control from 1925 to 1995. Such case studies allow students to actively observe the role ethical argumentation has played in public debates in the United States throughout the twentieth century. Similarly, the multiple viewpoints on each case allow readers to experience the implications of different frameworks in action.A concise, straightforward introduction to the analysis of ethics and international politics for students in courses such as international relations theory, U.S. foreign policy, national/international security policy, and political theory, the book's main emphasis is on bringing theory and practice together. 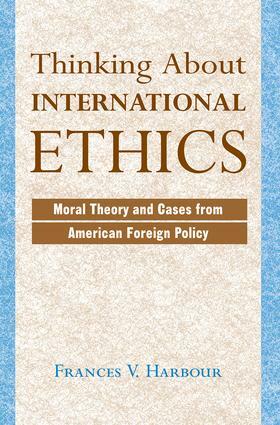 Both students and practitioners of politics will benefit from reading Thinking About International Ethics by gaining not only a deeper understanding of traditional approaches to ethical reasoning but also by enabling an enhanced tolerance?and perhaps even civility?for the future.